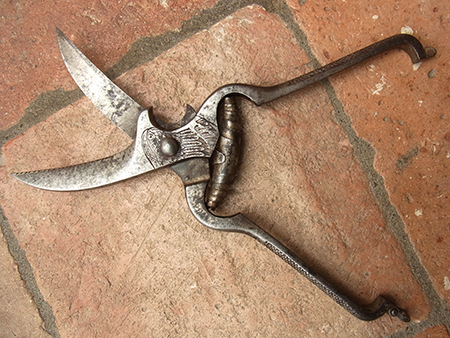 Vintage French early 20C Secateurs. These are Poultry Shears or Cisaille a Volaille. The shears are decorated with a very attractive birds head and have a lateral cutting notch suitable both for cutting bones . One can see a birds head with its eye, beak and crest feathers when looking at the blades. There is a clasp to fasten the shears closed. A rare collectors item demonstrating the art of Zoomorphism. 10 inches (26cms). There is an exact illustration in Daniel Boucard's book Dictionaire des Outils.